A photo from a July 15, 2013 visit to the Bear River Massacre site in southeastern Idaho. A couple days ago Molly and I made a site visit to the Bear River Massacre in southeastern Idaho. The massacre happened in late-January 1863 when a U.S. Army group of California Volunteers led by Col. P.E. Connor attacked a domestic, non-combatant encampment of Shoshone. It is interesting to contextualize this site with others throughout the United States. Nine months later, General Alfred Sully described his actions at Whitestone Hill against families of Lakota, Dakota and Nakota as a “murderous slaughter” of a “promiscuous nature.” This action happened on the northern Great Plains (in presentday North Dakota) only 9 months after the Bear River Massacre. Massacre was, sadly and to put it mildly, a part of the Total War battle rubric (check out John Fabian Witt’s latest work on Lincoln’s rules for war). It is called genocide and ethnocide today. Today, 150 years later, the Bear River Massacre site remains active with memorials of all kinds. If you are driving from Salmon, Idaho to Salt Lake City, Utah, take exit 36 off of I-15 onto Highway 91. You’ll need to follow the exits, because there isn’t any signage that will guide you to this painful chapter in American history. At the site is a stone obelisk, and for the last 150 years different groups have brought different interpretations to the site. 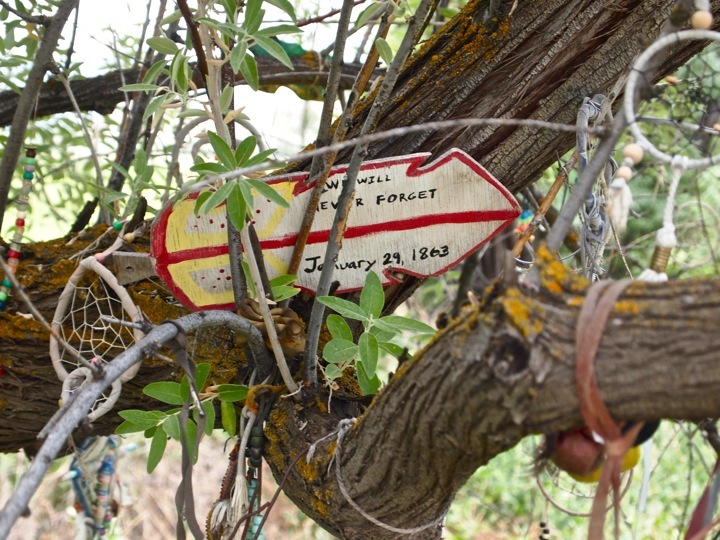 Some items of remembrance at the Bear River Massacre site. Photo from July 15, 2013. 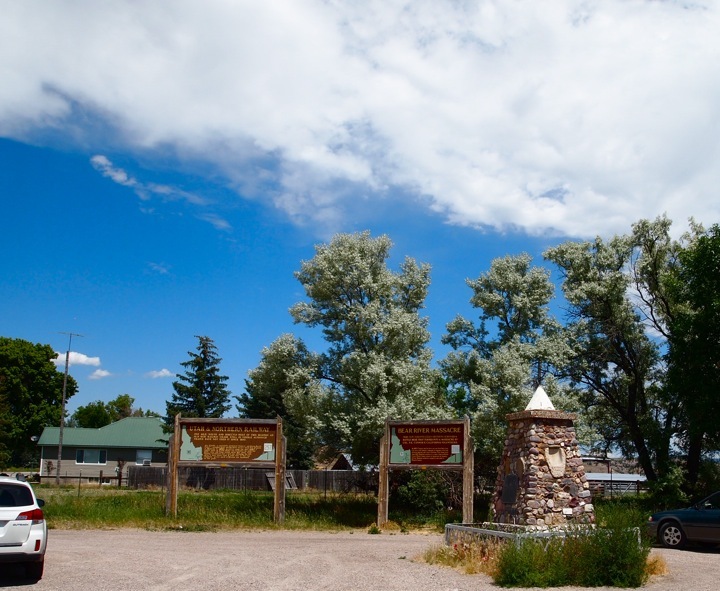 The Bear River Massacre site was designated a National Historic Landmark in 1990. Today a beautiful memorial tree has taken on the task of an anchor for remembrance and mourning. A variety of individuals have placed items in the tree. 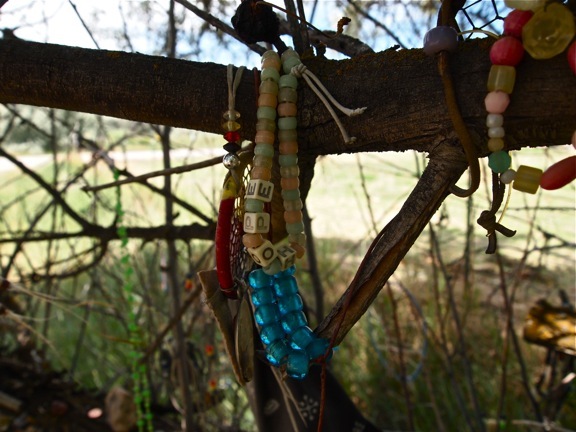 A cursory sample of items observed on the July 15, 2013 day of my visit to the site included numerous dream catchers; tobacco pouches; a pair of glasses; a penny; beads on leather necklaces (one read “HOPE”); a wood flute; synthetic flowers; a tin pale filled with beads and chewing tobacco; pieces of rawhide with art on them; and suspenders. The tree is active and alive, as are the memories. In addition to this, if you want to read up on contemporary scholarship specific to the Bear River Massacre, check out Kass Fleisher, The Bear River Massacre and the Making of History (Albany: State University of New York Press, 2004) and John Barnes, “The Struggle to Control the Past: Commemoration, Memory, and the Bear River Massacre of 1863” in The Public Historian, Vol. 30, No. 1 (February 2008). Photo from July 15, 2013. This entry was posted on Wednesday, July 17th, 2013 at 11:41 am	and tagged with Bear River Massacre, Civil War, Dakota, Idaho, Memory, North Dakota, Whitestone Hill and posted in Uncategorized. You can follow any responses to this entry through the RSS 2.0 feed.